Your dog is more than a friend, your dog is family. Feeding them great tasting, healthy dog food like Red Flannel is essential to taking care of their needs. Mansfield Feed Mill offers a variety of dog food brands that offer top notch nutrition for your pets. 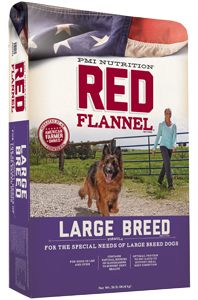 This month, our featured dog food is Red Flannel dog food by PMI Nutrition. This dog food is available in many varieties from small to large breeds to match your pets needs. Come by today to get your dog on a great food that will keep your dog health and active for many years to come. This entry was posted on Tuesday, May 10th, 2016 at 3:37 pm	and is filed under News & Updates. You can follow any responses to this entry through the RSS 2.0 feed. Both comments and pings are currently closed.